With external mode, you can log signals and tune parameters while the model is running on the target hardware in real time. When you change parameter values from within Simulink, the modified parameter values are communicated to the target hardware immediately. You can monitor the effects of the parameters tuning activity by viewing the algorithm signals on the scopes. 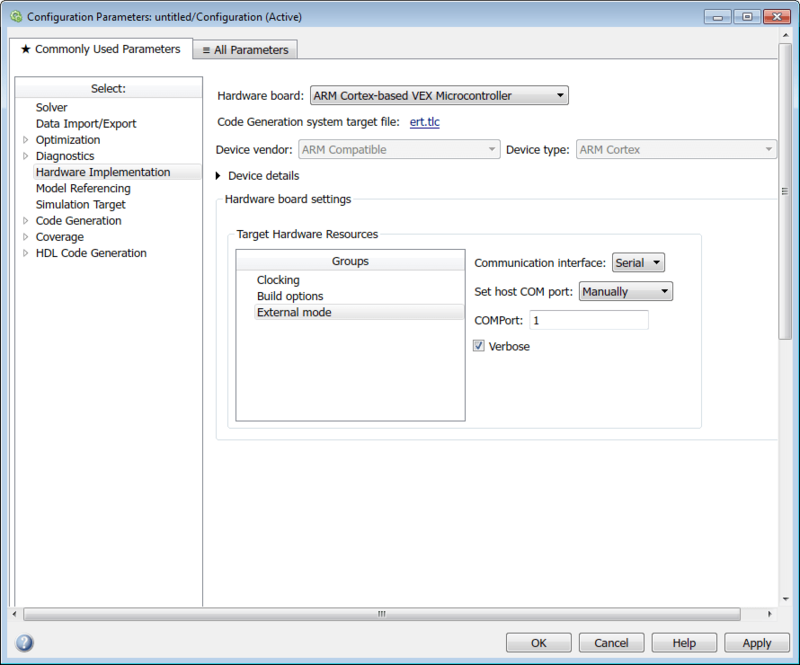 In the Configuration Parameters dialog box, select Hardware Implementation > Hardware board > ARM Cortex-based VEX Microcontroller. Under Target Hardware Resources, select External Mode. For setting the COM port automatically, in the Set host COM port parameter, select Automatically option. For setting the COM port manually, in the Set host COM port parameter, select Manually option. If you select the Manually option for Set host COM port parameter, specify the corresponding COM port in COMPort parameter. To find the COM port on your Windows® computer, select Start > Control Panel > Device Manager > Ports (COM & LPT). 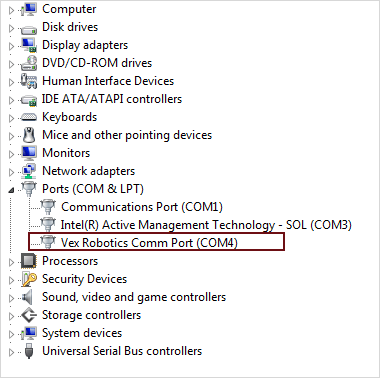 This command lists the path and file name of the USB device that is connected to the VEX® hardware. Make sure that you select the Verbose check box to view the external mode execution progress and updates in the Diagnostic Viewer or in the Command Window. Your model is now ready to run in external mode. Select Simulation > Mode > External.